Venue: ATIK, Liquid & Envy, Brook Street, Wrexham LL13 7LH, United Kingdom. Tickets: Price 1: GBP 5.00. 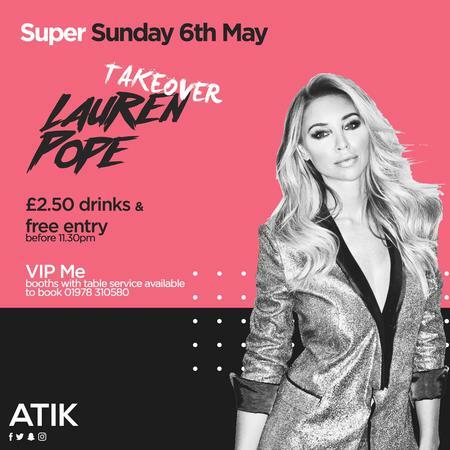 TOWIE's very own Lauren Pope is joining the Super Sunday line-up as our special guest DJ! Lauren will be in the main room whilst the usual r'n'b antics continue in Curve, and Vinyl brings the pop and party anthems to sing your socks off to!